Denver, you can have it all! 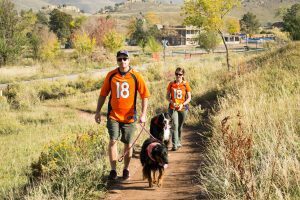 Broncos fans can fit in a Golden adventure and be settling into Mile High Stadium or home on the couch in plenty of time for game day kick-off. There might not be enough time to battle traffic to get from Denver to the mountains and back for the game. But Golden, Colorado offers the same mountain experience, and it’s located just 12 miles from the Mile High Stadium. So put on your game face to tackle your own adventurous challenge before the Broncos game. 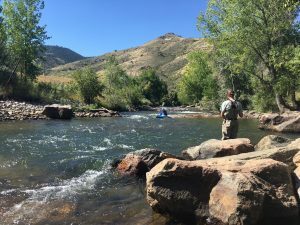 Here are seven exciting ways to burn some calories and have a great pre-kickoff day in Golden, Colorado. 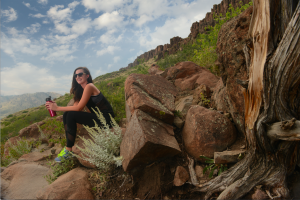 Bike or hike up North Table Mountain. One of the two broad, flat-topped mesas hovering above Golden, this rocky desert-like area is ringed by cliffs with a half dozen hiking trails crisscrossing it. 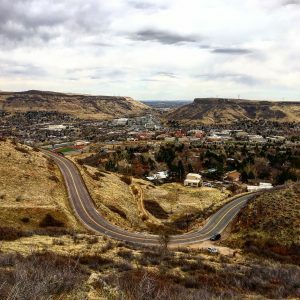 The longest hike/bike ride is a moderate 5.9 mile loop trail that will take you around — and over — the mesa top, with 360 degree views of Golden, Denver and the Front Range. A seasonal closure of Rim Rock Trail from February 1 to July 31 allows raptors to fledge successfully. A parking area on Colorado Hwy. 93 just north of town has maps. Shorter hikes head straight up the mesa over a lunar landscape of rocks to the distinctive top of Lichen Peak. Be on the lookout for herds of deer. Afterwards, enjoy pre-game brunch and a Bloody Mary at Abejas, Sassafrass or the Golden Diner. Hike or Bike Clear Creek. Begin right in the center of town and head towards the mountains. The paved bike/hiking trail is tree-lined and follows the creek, where you can stop and listen to the water as it tumbles down from the mountains toward town. Along the way, the trail passes the Clear Creek History Park, which has re-created the 1878 Pearce Homestead, complete with log cabins, barns and outbuildings, and a chicken coop. After a relaxing walk, stop for a pre-game lunch at one of downtown Golden’s restaurants. From classic Woody’s Pizza, to the southwest-influenced Table Mountain Inn, to the taste of Nepal at the Sherpa House Restaurant, to the most famous sandwiches on the Front Range at D’Deli, you can sit at an outdoor café, or get the meal to go and dine at picnic tables along Clear Creek…and still be home long before kickoff. Visit White Ranch. Ute and Arapaho Native Americans once camped and hunted on this land. In 1865, James and Mary Bond built a homestead and farm here. They were bound for California, but settled on this land after their young son was accidently killed under the wheels of their wagon. Their house still stands on the park grounds. There are 18 miles of multi-use trails offering a variety of hiking and biking trails with mountain and homestead views. The 4,300-acre park is located just 2.7 miles from downtown Golden. Afterwards? Grab a bite at the Old Capitol Grille in downtown Golden. When White Ranch was a working homestead, this restaurant was the Capitol Building of Colorado Territory. There are salads, burgers and sandwiches, amazing smoked meats and delicious appetizers. Hike among the Red Rocks at Matthews/Winters Park. Located just south of Golden on State Highway 93 , this Jefferson County open space park has 9 miles of trails. A particularly beautiful stretch is the 2.8 mile Red Rocks Trail, which climbs up some mild switchbacks, offering spectacular views of little-known towering red rock formations as you approach Red Rocks Amphitheatre. Another, more strenuous hike is the Dakota Ridge Trail, which climbs up and down along the twisting Dakota Hogback, an unusual geologic formation. The first dinosaur bones ever discovered were found along this hogback. Nearby on Dinosaur Ridge, you can see millions of year old dinosaur bones and dinosaur tracks, still visible in the rocks. It’s only a few minutes downhill to Golden to stock up on snacks before the game. Or maybe you want to watch the game in Golden? Try Wrigley’s for Chicago-style pizza and fare and pitchers of beer to share with your friends. Hike through Golden Gate Canyon State Park. One of Colorado’s most popular state parks is just 20 minutes from Golden and offers 35 miles of year-round trails through dense forest and across meadows rimmed with aspen trees. 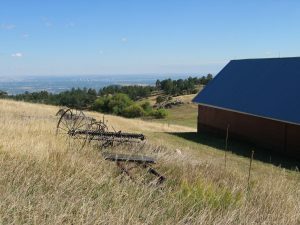 Whether you hike the Mule Deer Trail, the Raccoon Trail or the Snowshoe Hare Trail, make sure to plan a stop at the Panorama Point scenic overlook, arguably the best viewpoint on the entire Front Range with views of more than 100 miles of snowcapped mountains along the Continental Divide. Golden Gate requires a $7 daily pass, or an annual State Parks pass. 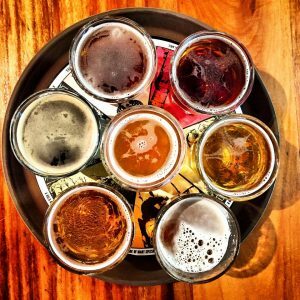 After the hike, stop in Golden for a pre-game drink at one of the town’s six craft breweries: Cannonball Creek, Mountain Toad, Golden City Brewery, New Terrain, Holidaily or Barrels & Bottles. Golden brews more beer than any city in the world! That’s because Coors is the largest single brewery in the world). You can take the first tour of Coors and enjoy three free samples starting at noon on Sundays. Climb South Table Mountain. The first T-Rex bones in the world were discovered on this high butte that rises above Coors Brewery. A pleasant 1.5 mile trail snakes up the mesa to the top, where there is a fantastic view of Golden and the entire Front Range. After the hike, stop back in Golden and shop Main Street, which is lined with one-of-a-kind boutiques, galleries, sporting goods stores, and bike shops. You’ll have time for some shopping before kick-off. 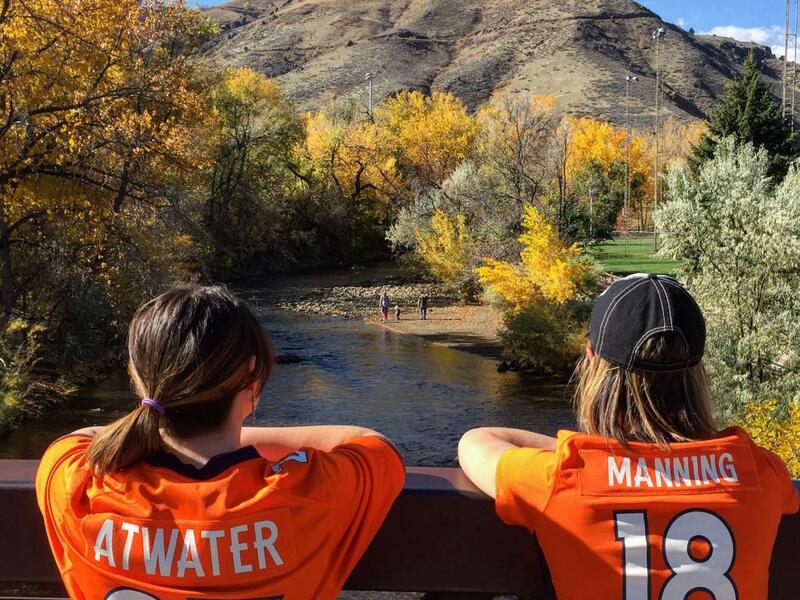 How about some gear for your next week’s pre-Broncos adventure? Head to one of the many Golden gear shops, including Peak Cycles, Vital Outdoors, Golden River Sports, Icelantic, Bent Gate Mountaineering or Powder 7.